Playdough to Plato is filled with fun learning activities for preschoolers, kindergarteners and first graders – a perfect balance between “Look at what I can do now!” and “I can’t wait to do that again!” Since we believe that learning can be both intentional AND fun, we were excited to pull together an A to Z guide for early literacy. What follows are 26 fun-filled ways to teach kids the basics of reading and writing. A is for Alphabet Books. As a kindergarten teacher, I always spent the first few weeks of school reading alphabet books to my students because they help children understand that each letter has a special name and sound. (That’s really important for kids to know before they try reading on their own later.) Check out my ten favorite titles here. B is for Book Treasures. One of my favorite ways to help children improve their understanding is by giving them book treasures like this one for “Lilly’s Purple Plastic Purse”. Each of these tiny, handmade keepsakes captures an important part of the story and serves as a helpful reminder of the book. Each time you give your child a treasure, ask him to share it with someone else by telling what happened in the beginning, middle and end of the story and why the treasure captures something important about it. 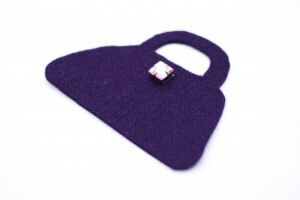 You will be amazed by the power one little trinket has on your child’s memory. Check out all of the details here. C is for Climb to the Top. 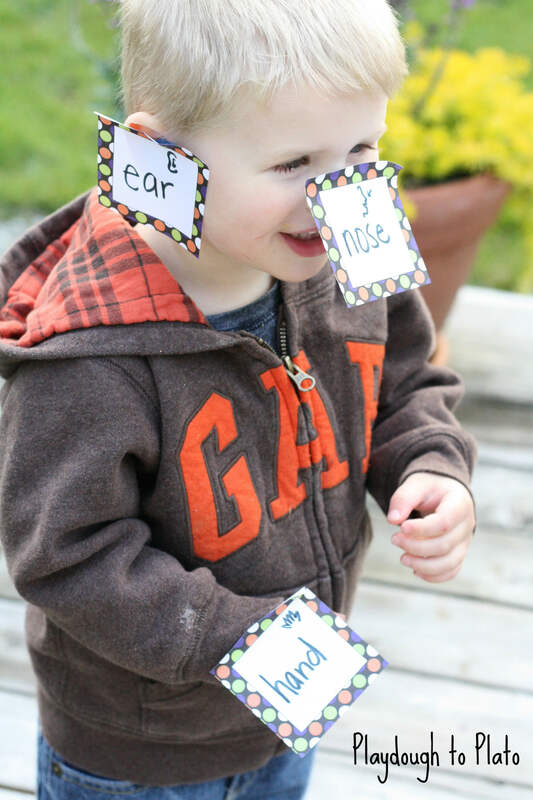 When a first grader I tutor was struggling to memorize sight words a little while back, I made it my personal mission to design several entertaining sight word games that were both entertaining AND effective. Hands down, one of her favorite activities from the bunch was this high energy die game I call “Climb to the Top”. Read more here. 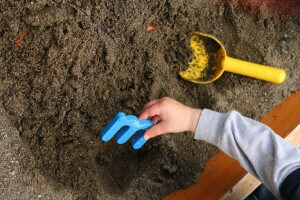 My oldest son loves digging in our sandbox. As I watched his face light up with excitement when he discovered a worm, I realized that the sandbox was yet another fabulous spot for helping him learn to recognize letters of the alphabet. 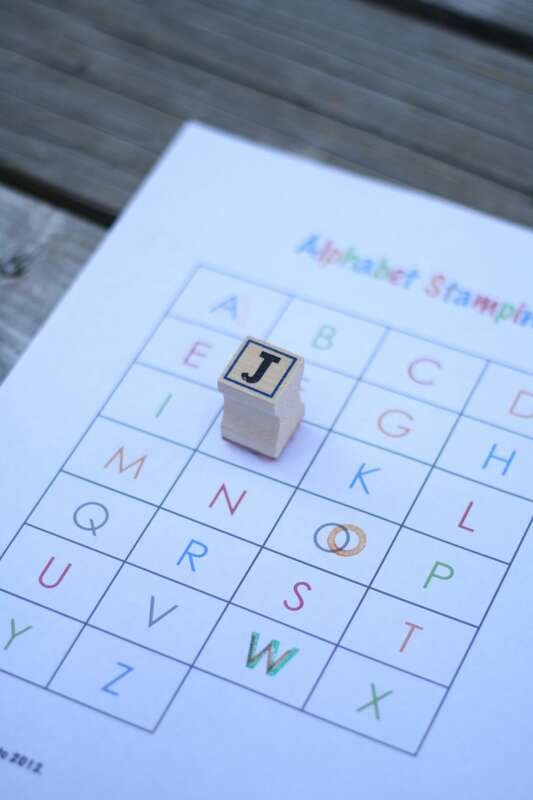 This alphabet treasure hunt is perfect for children who are learning the names or sounds of letters as well as little ones who are starting to match upper and lowercase letters. Find out how to organize your own hunt here. E is for Easy Reader Books. Even kids who don’t know how to sound out words yet can read on their own. I promise. Just hand them an early reader book. This special type of story uses repetitive text that closely matches the pictures so that new readers can predict the words. They are an awesome way to build children’s reading confidence! Add to your library by purchasing your own set of ten printable easy readers for boys or ten books for girls. F is for Flip Over Word Families. Sometimes, helping your child learn to read can feel like more of a snail crawl than you expected. Sound by sound, word by word, your child adds to his mastery list. One of my favorite tricks for helping the reading process along is teaching children word families. “Word families” are groups of words that share a similar spelling pattern. For example, the words fat, cat, bat and mat all end in the –AT sound and are part of the –AT family. There are plenty of teaching ideas available these days, but you can check out my three favorites here. 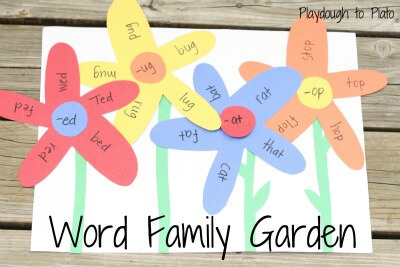 G is for Word Family Garden. Whether your kids are having a little spring fever or you need something to brighten your dark winter days, this colorful word family garden is sure to do the trick. 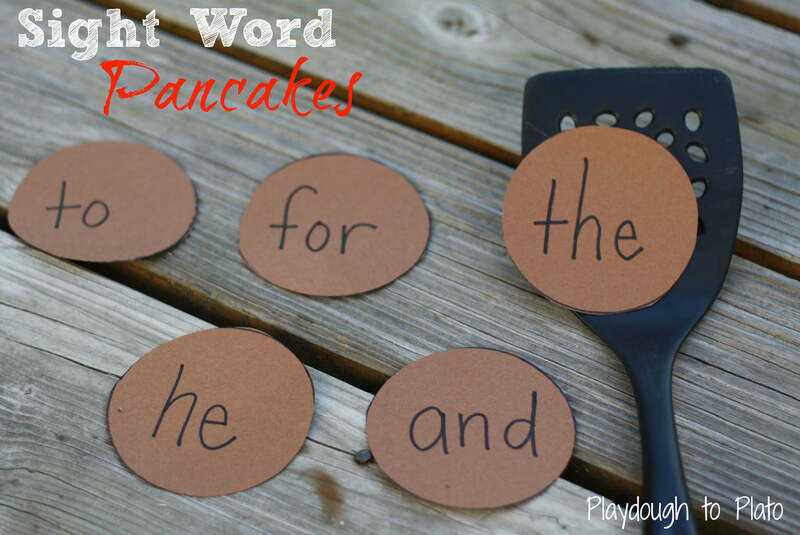 This activity is a great way to focus all of that warm weather daydreaming on an important reading concept: word families (groups of words that share similar spelling patterns). Click here for the how-to. H is for Head, Shoulders, Knees, Huh?! As a kindergarten teacher, I loved watching my students move through the first two stages of writing. They began by drawing pictures. They could make a sun, sand and ocean waves perfectly capture their family trip to the beach. And then something clicked and they would begin adding letters and words to their illustrations. Teachers call this labeling and seeing it for the first time always made parents beam with pride. My favorite way to introduce labeling to children is an entertaining post-it game that I affectionately call “Stick It!” Read more here. I is for I Can Tap It Out. Knowing how to break words into parts helps prepares kids for reading later. 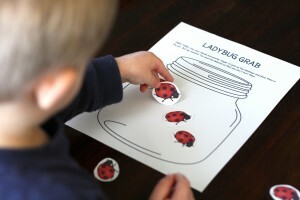 This hands-on game is a fun and active way to teach them that very thing. Check out all of the details and download a free printable follow-up game here. J is for Just Read. This one may seem obvious. One of the best way to teach kids how to read and write is to show them how important it is to learn and how to do it well. If you’re looking at a restaurant menu, read it out loud. If you’re writing a grocery list, say the words you’re writing. You’ll be amazed at how much time you spend reading and writing throughout the day and so will your soon-to-be reader. Whether your child likes to run, jump and kick her way through the day or prefers laying low, teaching her letter sounds through sight, sound and movement is an amazing combination. Using different parts of her brain at the same time actually accelerates her learning. “Alphabet Olympics” does just that. It’s an active, fun way to master letter sounds quickly. Check it out here. 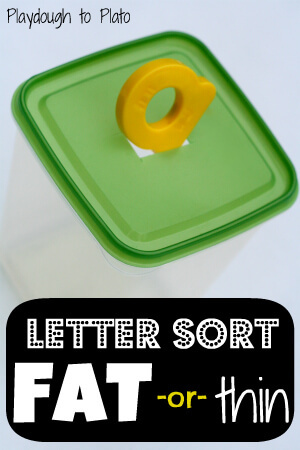 L is for Letter Sorting. Children learn to recognize letters by noticing what makes each one unique. Sorting is a simple and fun way to make those differences clear. In this sort called “Fat or Thin”, children try to squeeze letter cut-outs through a hole to decide if the letter is too fat and won’t fit or if it is thin and easily pops through the other side. Find all the details here. M is for Magic Squares. I’m always amazed that some of the simplest games are the most entertaining. Magic Squares is a perfect example. It’s a guaranteed distraction at restaurants, doctors’ offices and on airplanes. 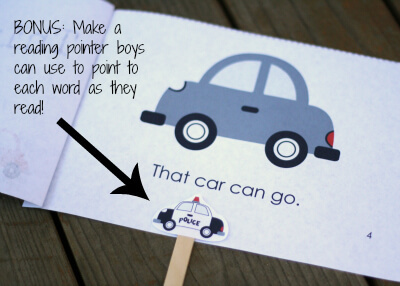 And, as a huge bonus, it’s a sneaky way to help kids learn alphabet letters or sight words. Download your own printable of it here. N is for Name Games. There is no word quite as special to a child as her own name. So it’s no wonder that many teachers (including me) use a child’s name to introduce the concept of what a letter is, how letters group together to make words, and how a child can use letters to spell. Although there are hundreds of activities that teach these important ideas, here are my five favorites. O is for On Your Mark, Get Set, Go. There are few toys my boys love more than their Matchbox cars. As I watched them eagerly race two cars at a time down their track, I was struck with an idea. With one simple twist, their playful competition would make a motivating and educational game. 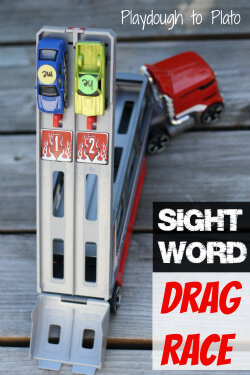 Find out how to organize your own sight word drag race here. P is for Pre-Writing Activity Pack. 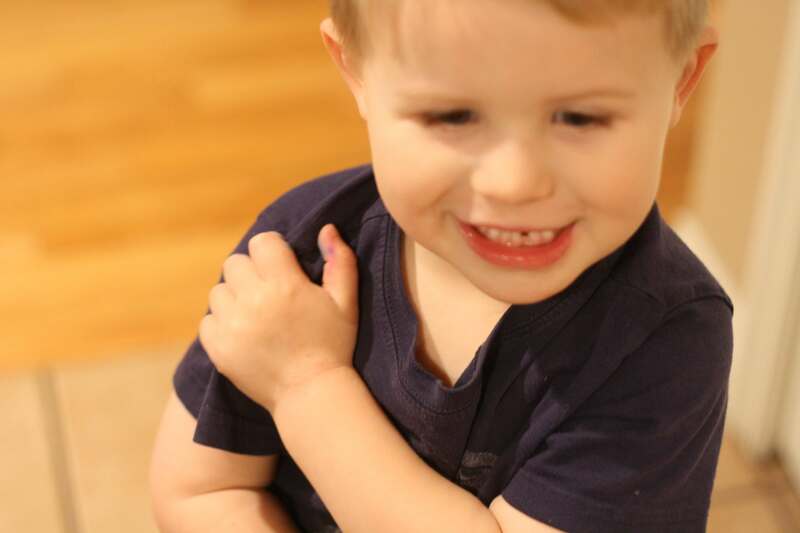 When my three year old recently looked at me with his big blue eyes and asked for help, “writing like his daddy”, I immediately launched into super mommy mode – pulling together fun, hands-on games that would strengthen his hand-eye coordination, hand muscles and fine motor skills. Check out the seven activities I created here. Q is for Questions During Story Time. Reading stories out loud with your children is a perfect opportunity to help them discover something new. Just a few simple questions can turn ordinary story time into a monumental revelation. But knowing what questions to ask can be difficult. Here are my 20 favorite questions to ask children during and after stories – including a free printable of the list. One of my kindergarteners’ favorite games to play toward the end of the year was “Word Rocket” – a fun way for children to practice sounding out and writing words as they count down from 10 to Takeoff. Check out the rules and download your free printable of the game here. Stamping makes everything more fun, doesn’t it?! Help your child learn the names of letters using this free colorful stamping sheet. 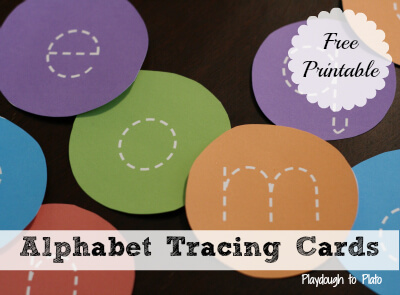 T is for Tracing Cards. They say practice makes perfect and that’s certainly true when it comes to learning how to write letters. These free colorful alphabet tracing cards use a font that’s very similar to Handwriting Without Tears’ – a popular handwriting program for kids. The simple circles, lines and curves are designed to help children learn to write letters more quickly. Download your own set and check the fun follow-up activities here. U is for Use a Spatula. When I think back on my favorite childhood breakfasts, they always seemed to include a short stack of pancakes. Just thinking about them now puts a smile on my face. 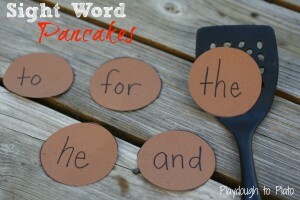 Sight Word Pancakes is a simple game that uses this classic breakfast food to help children playfully learn sight words. Find the details here. V is for Very Simple. Sometimes I have to remind myself to just keep things simple. 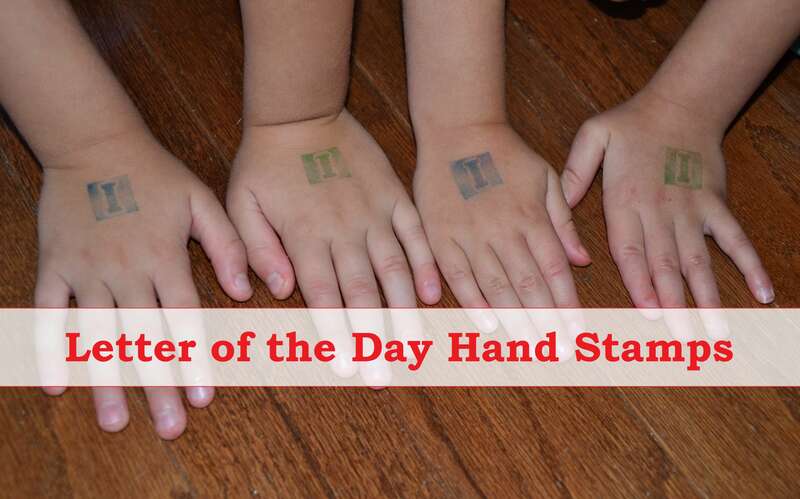 These letter of the day hand stamps from In Lieu of Preschool are a perfect example of that very thing. In the morning, stamp your child’s hand with a letter. Then refer to it throughout the day to help teach letter formation, letter names, left/right and more. Find an awesome list of follow-up activities here. W is for Wordless Books. If you’ve read “Goodnight Gorilla” or “Hug” with your child, you know how entertaining wordless books are. You and your child use just the pictures you see to invent the story as you go along. But the benefits of wordless books reach beyond entertainment. Children use them to “read” before they know how to sound out words and they learn to use picture clues to figure out what is happening in a story. That skill comes in handy later when they have difficulty sounding out a word in books they read. Find a huge selection of wordless picture books here. Ok, the title of this category is a little bit of a stretch. Finding the hidden treasure underneath one of the cups isn’t exactly as simple as looking for an X. But it’s addictively fun nevertheless. 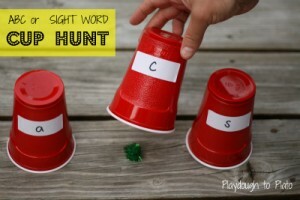 Cup Hunt is a playful, hands-on way to help children practice letters or sight words. Check out the details here. Y is for Yarn Letters. Building letters with Legos, blocks, pom poms, etc. is a great way to help children notice the unique shape of each letter. Find out how Hey Mommy Chocolate Milk helped her son learn about letters using yarn and sandpaper here. Z is for Zoo Scavenger Hunt. Teaching kids how to read and write can happen almost anywhere… even at the zoo. Download your own copy of I Can Teach My Child’s free printable zoo scavenger hunt here and prepare for some serious fun.